We’ve been talking a lot about Google lately – and we are again! We’re announcing our release of Google Posts integration to the SinglePlatform portal. Google Posts is a feature that allows businesses’ announcements to be discovered in Google search results & Google Maps. And now you can create Google Posts within your SinglePlatform account. Google is always looking for new ways to innovate the online experience & to make businesses like yours more discoverable. With Google Posts, you can incorporate images, videos, and GIFs to make them eye-catching to online researchers. The advantage? 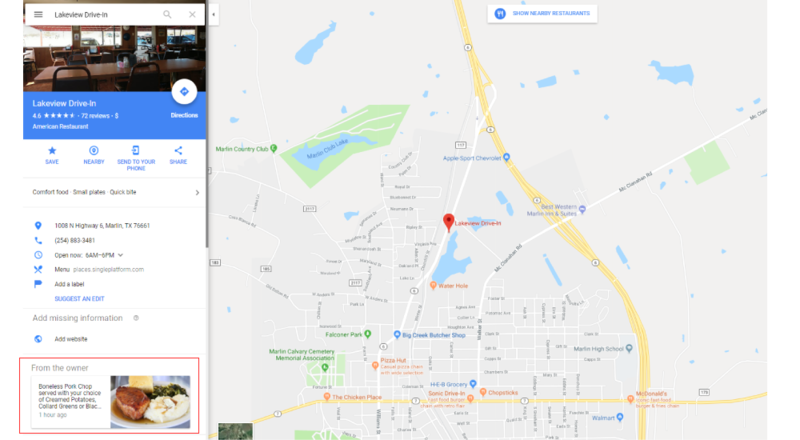 When a diner searches for your restaurant, they’ll be getting owner-verified content right within the search results and maps, so they’ll be hearing directly from you and learning about current offerings and events right away. To be able to post, you’ll need a verified Google My Business (GMB) account for your restaurant. Read our guide on how to claim your Google My Business listing. Don’t want to set up your account yourself? We can do the work for you! Due to our unique partnership with Google, we can claim your restaurant and get your Google My Business account set up on your behalf. Just contact us! Unsure if your business is verified on Google My Business? You can reach out to our Customer Success Team via email at customersuccess@singleplatform.com. Of course, you can create and control your posts within your Google My Business account directly if you prefer, but now, as a SinglePlatform customer, you can choose to create your content right from your SinglePlatform portal in the announcement section! This allows you to save time & repetitive effort. The announcements section within SinglePlatform is a tool that allows you to post and schedule messages and updates on different social media channels. Now, Google Posts is also integrated into this function. As a SinglePlatform customer, your posts from the announcements section of our portal will now be visible as Google Posts as long as you have a verified Google My Business account. When you make an announcement for your SinglePage, Facebook & Twitter accounts, it will automatically be pushed to Google Posts as well, so there’s no additional work on your end. Save time and effort using our integration to Google Posts. Here is how a SinglePlatform customer’s posts appear in Google search results and Google Maps. Please note that your post will be live on Google for seven days before it automatically expires, but you can also select a date to remove it earlier than that via the SinglePlatform portal. Google Posts is a great tool for posting about weekly events, happy hour specials, live bands, and current discounts and deals. Google posts only stay live for 7 days (they automatically come down after 7 days). You can post weekly recurring Google Posts if you would like to keep a Google Post in search results. Google Posts within the SinglePlatform portal supports adding photos. This new advancement is an exciting opportunity for you to gain even more visibility online! Take advantage of the tool in order to get in front of your customers right at the beginning of their search. Interested in learning more marketing tips for your restaurant? In our blog, we break down 9 useful tips for marketing your business. Read it here.